People often ask me how did I get into the ice cream trade? Did I take over from my Dad or another family member or did I buy the business off someone? Well the short answer I give is No! I started When I was a kid and I’ve done it ever since. As far back as I can remember I was always mesmerised by ice cream vans. My mother tells me that I wasn’t even 2 years old and every time I heard the jingle of an ice cream van outside our house I was straight up looking out of the window at it, and there were quite a few different ice cream vans that came around back then in the early 70s. 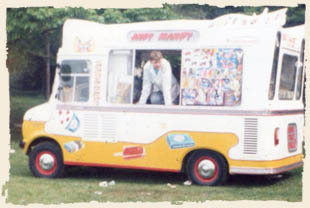 I’d have an ice cream off a van most days and I wasn’t the only one, the ice cream vans used to stop in the street and nearly always had a queue, no one had freezers back then and there were no shops open on Sundays or late evenings, no supermarkets selling the multi-packs as they do now. As many as ten different vans would come round the estate where I lived in any one day. It was in the late 70s when I started helping out on ice cream vans that traded on the estate where I lived in Leicester. I was about 8 years old (I didn’t really do a lot but I enjoyed the ride around the estate) This became a regular habit. By the time I was 13, I was cleaning and loading vans before going out with drivers, often I would go out with new drivers and show them where to go and what to do. Every weekend, after school and on school holidays I was out on the ice cream van. It became my full time job when I left school and when I passed my driving test at the age of 17, the very next day I was out driving an ice cream van myself. I bought my own ice cream van when I was 18. It was an old van and often broke down but I worked hard to buy a better van and worked even harder to gradually build up a small fleet of ice cream vans.